SUMMARY: Football is 17-year old Ashtyn Parker's life. She's the captain of her high school varsity team and hopes to attract the attention of college scouts and follow in her idol's footsteps. Just expelled from his prep school for a prank that got out of hand, Derek Fitzpatrick is forced to move from California to Chicago with his stepmother and stepbrother. But things get complicated when Derek discovers a beautiful football-loving girl named Ashtyn also lives in the house where he sleeps in the den. REVIEW: I am a devoted Simone Elkeles fan, and as such, Wild Cards did not disappoint. As with the Perfect Chemistry series, I wolfed down Derek and Ashtyn's story almost without stopping. I adored Derek's flippant, sarcastic style and ability to see right through the front Ashtyn puts forth. Ashtyn is a little annoying and whiny, but her banter with Derek cracked me up. Derek's grandmother is one of the most annoying characters I've read in awhile; I could have done just fine without her and her purple umbrella and her expecting everyone to do her bidding. The Texas accents were also annoying. I've lived in Texas for almost 18 years, and I don't know a soul who talks that way. 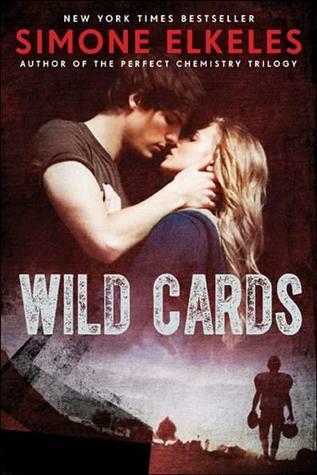 As with all Elkeles books, Wild Cards would be a great choice for reluctant reader girls. The engaging dialogue and quick-moving plot make the story easy to get into and stick with. THE BOTTOM LINE: Elkeles fans will love it, as will anyone who loves romance and new adult novels. The romance is steamy and has plenty of sexual content. As such, it is best for upper-high school and adults (see content notes below). STATUS IN MY LIBRARY: The sexual content is high, so I can 't get it.